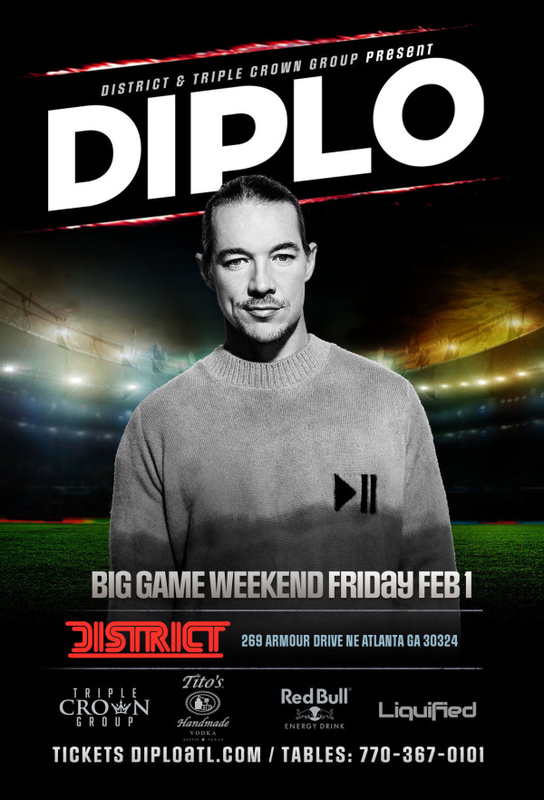 Atlanta, a city known for partying, only gets the Big Game once every few decades. So when it does come, you can expect one thing - great parties! This Big Game FRIDAY is no different as District welcomes the massive artist - DIPLO. Tables are available. Please contact 678-758-4769 for table reservations. BUYER BEWARE: Eventbrite and TicketMaster are the ONLY authorized ticket sellers for this event. If you buy a print-at-home-ticket or hard ticket from an unauthorized vendor or source (ie: Stubhub, ebay, craigslist) we cannot guarantee that it is a valid ticket. Eventbrite, Triple Crown Group and District are not responsible for any counterfeit tickets and cannot provide refunds or exchanges.